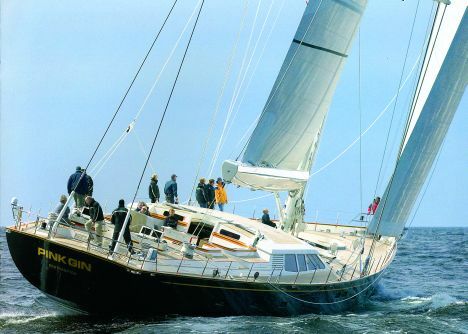 Baltic Yachts launched its 152' "flag ship" named Pink Gin in the summer of 2006. She has a classic design specially made for an affectionate client of the Finnish shipyard. In collaboration with Judel/Vrolijk & Co. and with Design Unlimited, Baltic Yachts focused on performance and onboard comfort. Speed was obtained by employing light manufacturing materials such as composites and carbon coupled to a generous sail plan managed by last generation auxiliary systems which allow for perfect control even with a relatively contained crew. Every manoeuvre is easily controlled from the cockpit area where the two helms are supplied with hi-tech panels to monitor and manage a great many functions. The main deck is in teak and has a cockpit fitted out as a small saloon for the guests' pleasure and comfort. At its stern a good sized tender slips into a specific cavity. The deck house hosts another small saloon opposite a chart table area. Sleeping quarters are below deck subdivided into an area for the crew from mid-ship to stern and one for the guests to the bows of it at the end of which the master cabin may be found. The master cabin has an office area, sofa and large bathroom whereas the guests have three cabins at their disposal one of which has bunk berths, another has separate ones and the last one is a "vip suite". At the centre of the yacht in correspondence with the deck house there is the main saloon to starboard and the dining area to port. The crew's quarters, situated at the yacht's stern, have an independent passage and consist of three cabins for a total of six berths, a mess room, a large galley and service area. In this zone there is yet another double cabin designed to accommodate special guests. Among many technical solutions found, the 6.10 metre mobile keel, is noteworthy. In fact, when Pink Gin is not navigating, the keel may be reduced up to 3.75 metres permitting her to reach shallower depths and anchor safely in most pleasure yachting harbours. For further information: Baltic Yachts, Balticvägen 1 FIN-68555 Bosun, Finland: tel. +358 67819200. fax +358 6 7819222: website: www.balticyachts.fi. Email: info@balticyachts.fi. Draught: 6.10 to 3.75 m.
Design/Engineering: R&J Design, Baltic Yachts, Design Unlimited.